1.  What is the difference between reflex action and walking? Reflex action is involuntary action which means it is not under control of brain only involves spinal cord, it is rapid, thus gives instant response to the stimulus and not affected by our thinking. But walking is a voluntary action controlled by brain involves central nervous system and spinal cord both and affected by our thinking. The synapse is the tiny gap (not seen by naked eyes) between two adjacent neurons. This information, acquired at the end of the dendritic tip of a nerve cell sets off a chemical reaction that creates an electrical impulse. This impulse travels from the dendrite to the cell body, and then along the axon to its end. At the end of the axon, the electrical impulse sets off the release of some chemicals. These chemicals cross the gap, or synapse, and start a similar electrical impulse in a dendrite of the next neuron. This is the process how nervous impulses travel in the body. Similar synapse finally allows delivery of such impulses from neurons to other cells, such as muscles cells or gland. When agarbatti burns, it produces pleasant smell, which is detected by the olfactory receptor present inside the nose. The action of smell generates the electrical impulse. These impulses are carried to the sensory area of brain(forebrain-cerebrum). Thus we detect the smell of agarbatti. All information from our environment is detected by the specialised tips of some nerve cells. These receptors are usually located in our sense organs, such as the inner ear, the nose, the tongue, and so on. So gustatory receptors will detect taste while olfactory receptors will detect smell. Reflex action occurs in spinal cord. The brain and spinal cord constitute the central nervous system.  They receive information from all parts of the body and integrate it. The chemical substances produced in plants which control growth, development and responses in plants, are called plants plant hormones. For example: Auxins, Gibberellins, Cytokinins and Abscisic acid. 1. It is not a growth movement. 1. It is a growth movement. 2. It is a nastic movement which does not depend on the direction of stimulus. 2. It is a tropic movement which depends on the direction of stimulus. Auxin is a plant growth hormone. When the tip of the tendril touches a support, then the auxins present on its tip moves to the side of tip which is away from the support, so, due to more auxins in its tendrils away from the support grows faster. Hydro’ means water. 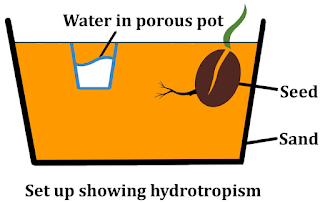 Hydrotropism means growth towards water. Materials Required: Seed, A big container, Porous water pot, water and Sand. • The tray should be big enough to accommodate the porous pot. • Fill the tray with sand and insert some seeds in it. • Make a pit in the sand and insert the porous pot in it. • Fill the porous pot with water. • Leave the set up for about a week. After a week when seeds are taken out, it is observed that roots grow in the direction of the porous pot. This shows hydrotropic movement in roots. The chemical coordination in animals takes place by the action of chemical called hormones. They are produced in certain glands in body in very small amount and poured directly in the blood. They are target based means works on particular organs and these organs are called target organs. The hormones control and coordinate various functions of the body such as development, growth, sexual changes etc. Iodine is necessary for the thyroid gland to make thyroxin hormone. Thyroxin regulates carbohydrate, protein and fat, metabolism in the body so as to provide the best balance for growth. Iodine is essential for the synthesis of thyroxin. In case iodine is deficient in our diet, there is a possibility that we might suffer from goitre. One of the symptoms in this disease is a swollen neck. Adrenaline is secreted directly into the blood and carried to different parts of the body. The target organs or the specific tissues on which it acts include the heart. As a result, the heart beats faster, resulting in supply of more oxygen to our muscles. The blood to the digestive system and skin is reduced due to contraction of muscles around small arteries in these organs. This diverts the blood to our skeletal muscles. The breathing rate also increases because of the contractions of the diaphragm and the rib muscles. All these responses together enable the animal body to be ready to deal with the situation. Such animal hormones are part of the endocrine system which constitutes a second way of control and coordination in our body. Diabetes patients as a treatment, they might be taking injections of insulin. This is a hormone which is produced by the pancreas and helps in regulating blood sugar levels. If it is not secreted in proper amounts, the sugar level in the blood rises causing many harmful effects. All information from our environment is detected by the specialised tips of some nerve cells. These receptors are usually located in our sense organs, such as the inner ear, the nose, the tongue, and so on. So gustatory receptors will detect taste while olfactory receptors will detect smell. We detect that we are touching a hot object by the action of receptors present on various organs or tissues. If olfactory receptor not works properly then we are not able to smell things like aggarbatti, perfumes, flavour of food. (i) Cell body: It is a typical animal cell which contains cytoplasm and a nucleus. (ii) Dendrites: A number of long and thin fibres comes out from the cell body of the neurons, they are nerve fibre. The shorter fibres on the cell body of neurons are called dendrites. 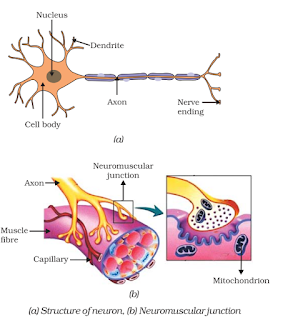 (iii) Axon: The longest fibre on the cell body of neurons is called axon. It has an insulating and protective sheath (or cover)of myelin around it. The information, acquired at the end of the dendritic tip of a nerve cell, sets off a chemical reaction that creates an electrical impulse. This impulse travels from the dendrite to the cell body, and then along the axon to its end. At the end of the axon, the electrical impulse sets off the release of some chemicals. These chemicals cross the gap, or synapse, and start a similar electrical impulse in a dendrite of the next neuron. This is a general scheme of how nervous impulses travel in the body. A similar synapse finally allows delivery of such impulses from neurons to other cells, such as muscles cells or gland. It is thus no surprise that nervous tissue is made up of an organised network of nerve cells or neurons, and is specialised for conducting information via electrical impulses from one part of the body to another. Photo means light. The response of plant towards the environmental triggers, light which change the directions that plant parts grow in is called phototropism. The directional, or tropic, movements can be either towards the light, or away from it. So, in two different kinds of phototropic movement, shoots respond by bending towards light while roots respond by bending away from it. For example: Sunlight bends towards the sun from where the light is coming. This is the response of sunflower towards the plants. Reflex actions are involuntary actions and controlled by the spinal cord thus, gets disrupted in case of spinal cord injury. Plants do not have nervous system but still sense the things because of stimulus such as gravity, light, chemicals(hormones), water, touch (touch -me -not plant).Hormones are responsible for the chemical coordination of plants by integrating their behaviour by affecting growth of a plant resulting in movement of that plant part in response to a stimulus. 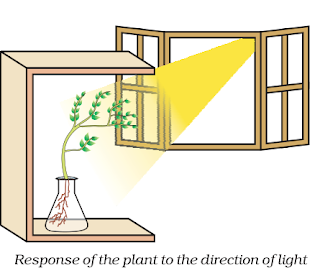 When sunlight falls on the shoot from one side, the auxins hormone causes the shady side of the shoot to grow faster, making the shoot bend towards sunlight. Controlled movement must be connected to the recognition of various events in the environment, followed by only the correct movement in response. In other words, living organisms must use systems providing control and coordination. In keeping with the general principles of body organisation in Multicellular organisms, specialised tissues are used to provide these control and coordination activities. (i) Coordination is needed for all human activities like, thinking and behaviour. Our breathing process, hearts beats, we dance, read, write by the action of our nervous system. Our nervous system gets information from surroundings and processes it and then respond according to it. The endocrine system (hormonal system) helps in integrating various metabolic activities like reproduction, development, all reflex actions (cope up with various give up situations). (ii)The hormonal system in plants helps in process of photosynthesis; they need carbon dioxide, water and sunlight. The stomatal opening in leaves opens up to allow in carbon dioxide gas, the roots bend towards water and the stem grows towards sunlight, the tendrils in climbing pants are supported by the hormonal system of the plant body. Thus, we have need of control and coordination system in an organisms. Involuntary actions are not controlled by us they are independent process means there is no stimulus involved in these actions but reflex action is also involuntary in nature but they involves stimulus means functions or respond according to it. Involuntary actions: heart beat, breathing process; etc. Reflex actions: stepping out in bright light, changes in size of pupil of eyes. 1. Made up of neurons (nerve cell). 1. Made of secretory cells (glands). 2. Messages transmitted in the form of electrical impulses. 2. Messages transmitted in the form of chemicals called hormones. 3. Messages transmitted along nerve fibre. 3. Messages transmitted along blood stream. 4. Effect of message usually lasts for a very short while. 4. Effect of message usually lasts longer. 5. Messages travel very quickly. 5. Messages travel more slowly. The movement of sensitive plants leaves takes place due to the sudden loss of water in the pad-like swelling (called pulvini) at the base of all the leaves. Pulvini limp gets drooped and folded due to the loss of water. On the other hand, the movement of our legs take place due to pull in the muscles of legs on the leg bones. nice and simple answers,keep it up!!!! What are the differences between the parts of the human brain? ?